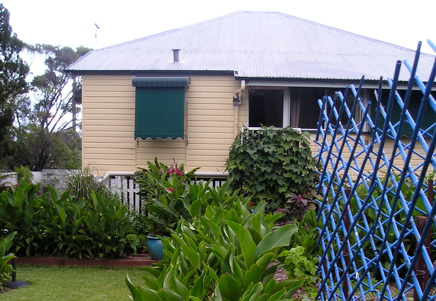 Bellis is an ordinary, rather elderly Queenslander house in Brisbane’s Bayside. It’s been retrofitted for sustainability by it’s owners, Jerry Coleby-Williams and Jeff Poole who were rather startled to learn that they had become suburban pioneers. Bellis is not an attempt at self-sufficiency but an indicator of how we can turn the suburban sprawl of Australia’s cities to an environmental advantage without compromising our Australian lifestyle. We grow food, we harvest rainwater and solar energy and we treat and reuse our wastewater – all things that can be done with ease by any homeowner in Australia’s suburbs. You’re welcome to take a look around. Remember, sustainability is mostly about living within your means. Don’t be discouraged if you can’t do a whole lot of things at once. Take small, meaningful steps that you can guarantee to carry out. The cumulative effect is what matters. 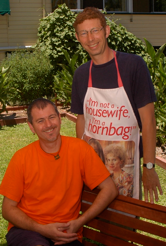 I just came across this website after visiting the gardening Australia website. I was wondering if you had another open day coming up in the future as I was disappointed that I missed the last one. My partner and I would really love to get some ideas for our place which is west of Ipswich on the way to Toowoomba. Also, do you have any ideas for what we can plant along our back fencline which meets very moist (and sometimes flooded) wetlands. We’re not having much luck on our sloping block when planting things down the bottom. I open through Open Gardens Australia. Next is May 2013. Hi Folks, my wife and I have been followers of yours for a long time. I have had great success following you tips, I make weed tea by the 60 litre dustbin at a time and I have allways got a drew on the go. I have a problem that I hope you can help me with. We live not to far from you at Victoria point, I have some magnificent looking pumpkins growlng but not a flower in sight is there anything I can do? I have written a reply on this website to your and another gardeners query about pumpkin. Please never include private contact details when replying on a public page like this. In deleting them to protect your privacy I will lose this email response and then you have no idea if I have received your email or replied to it! Canna edulis, Queensland arrowroot, likes moisture. Gahnia sieberi, Cutting sedge, is a moisture loving native. I’ve been opening my garden through Open Gardens Australia twice yearly for seven years now, so check their website for details. I’m sure this is an often asked question, but do you have a non-toxic way of dealing with Nutgrass? I seem to recall you recommending something like using vegetable oil to smother the bulbs.? How would this be applied over a larger area/infestation? I have observed that it is less prolific in shady, darker areas, but my fruit orchard and berry mound will take at least a couple of years to be throwing shade over the area. Hand pulling seems unproductive and futile, and I don’t think smothering works either. Thank you for your generous attendance and wisdom shared at the wet, yet welcoming, Mullumbimby Community Garden yesterday. Nutgrass has consumed my gardening experience for several years now. I was determined to eradicate it by hand-weeding and have committed countless hours to the task. Alas, I recently conceded defeat as the burden had finally taken its toll…With a heavy heart and great guilt I turned to glysophate and yet after a few months regular application are no closer to ridding my garden nemesis. I would be very grateful to receive any tried and proven advice you may have on nutgrass eradication, as my research to date has been discouraging and yielded no practical or conscionable solutions. I love the people, place and gardens of Mullumbimby. I just wish I had more time to relax and get to know the folk who were there. On this occasion I left early because I was concerned about leaving my place untended during the rain. We had 175mm (7 inches) fall that day. I was also fostering a parrot and had my own pets to get back to feed. We did trials on nutgrass control when I managed Sydney Botanic Gardens. The most expensive and least satisfactory solution was using Sempra, which is sold specifically for controlling nutgrass. It’s almost useless because most nutgrass recovers. The best chemical solution uses glyphosate. Use a plastic bucket and make 4.5 litres of solution (1 gallon) at half the rate recommended by the manufacturer. Use a plastic bucket and add tepid or warm water. Add to this one cupful (250 ml) of urea. (Urea is a dry, crystalline product commonly sold by the bag at hardware stores/ nurseries/ garden centres). Stir thoroughly. Urea dissolves best in warm water, but takes a bit of patience. Pour this into your spray pack, ideally through a fine sieve, pantyhose or a paper filter to remove any impurities or small grains of undissolved urea – stuff that may block the nozzle. Nutgrass dislikes alkaline soil, so testing soil pH and adding dolomite or lime will help slow its spread. Other than that, nutgrass can’t cope with deep mulching. do you have a date set in May for your open day? I would like to organise a visit with my community garden group? Hi Jerry I hope it is ok to ask you a question on this site. I have a cape gooseberry bush with lots of developing fruit on it but the leaves are drooping and watering has not made them bounce back. I loved seeing your garden on Sunday! I hope I can recreate something like it when I buy a new house. thank you for your passion. Leilani Garland. Sometimes you can overwater and constantly moist, warm soil in the subtropics encourages root rot fungi. They are the commonest cause of this condition: wilting in moist ground. I find the best solution is to water on alternate days and if possible, allow the soil to go dry in between waterings. This reduces damage. Good luck! Is any special attention required to processing the aerial potato yam before eating, or can they simply be peeled and cooked like its relative the winged yam. Also can the aerial potato be eaten of its vine at anytime. Eat mature yam. Think potato, potato in a different wrapper. Hello Jerry, we were disappointed to miss the last open day at “Bellis”, and are wondering if you could tell us when the next one is going to be held? Hi Jerry, we were really impressed at your address this evening at the Eco Centre. Your sharing personally and your honesty and way of dealing with forthcoming climate issues was real and helpful. Thank you for the time you gave to share with us. Hi Jerry, I enjoy you TV appearences very much. I want to plant potatos in my yard at Morningside. the seed I have has gone green, is it safe to plant these or should I dump them. Please do not post questions in the comments section. Use the email facility provided. There’s heaps of information about growing potatoes on the web,including the Gardening Australia website. You must expose potatoes to sunlight to start them sprouting before planting. It’s too late to plant potatoes in the subtropics. They are a temperate crop and here you plant in autumn. Thank you so much for your kind words and encouragement. Jerry , Mate I had the privilege of being at your open garden recently and I have got to tell you 3 things Loved your garden , Loved that fact that you gave me a peice of the Vine growing on your back stairs , BUT Jerry , the bottle of Lime Pickle I bought was just unbelievably delicious ,OMG just DELICIOUS . I’m still trying to catch my breath after having the Chilli Pickle I bought . Thanks Jerry hopefully will see your garden again .